My Clara, at liberty and trotting up fast. This week, I attended Cavalia, the Cirque du Soleil-inspired performance event combining horses, acrobats and dancers. There were beautiful horses, an outlandishly great live band, and a stage that altered time and space. Unrecognizably. It’s the largest traveling show in the world, mind boggling in it’s scope. And yet, there were moments so heartfelt and impossibly beautiful that they will be forever intimately tattooed on my brain. Disclaimer: This isn’t a review. And generally, I am not much fun at equine events. I can never just look at the pretty because the language of the horse is always louder to my ear than anything else. We don’t always put the horse first. I say it enough that my clients mock-lip sync along with me, “I work for the horse.” It makes me a party-pooper on Kentucky Derby Day. So I am about to give Cavalia the biggest compliment that I can: For the most part, the Cavalia horses seemed happy. The liberty segments were by far my favorite. In our world of controlling horses into a human frame of obedience, there was an overwhelming feeling of natural freedom, watching as over 30 horses galloped at liberty, tails-flagged and moving as a herd with their humans. Equine personalities were more individually obvious than the humans were, as if everyone agreed the horses were the stars. There was a generous spirit of partnership and volunteering on the part of all of the performers. Quite an accomplishment! Humans can get in a hurry. We’re born dominators, it’s hard for us to listen. Some of us think that a horse is not capable of doing advanced work without intimidation. In my experience, it isn’t true. But it’s us that has to change. We have to give up control for cooperation. Do you and your horse do ground play? I don’t think there is a better tool for building a relationship with a horse. It’s something lots of us did as kids before we had a name for it. We went into the pasture and pretended to be horses. Remember? I am always surprised at the resistance riders have to start a ride with some of that now. Maybe the term ground work has a bad connotation? You know that this kind of horse interaction existed long before there were videos of trainers waving trademarked sticks at a horse’s face, right? Just give it a try. In the beginning, you won’t make the exact same performance art impression as Cavalia. Riding to the music on your smartphone isn’t the same as having a private orchestra and if you have an arena, it might not have mood lighting. You probably don’t have a flowing costume that glides magically in the air. Your horse might have a manure stain here or there. Maybe you’re bittersweet, being at an age where some kinds of riding are behind you. Or maybe you’re a novice rider and still a bit nervous about the canter. WHO CARES? You have the same timeless dream in your heart. Get inspired! Get carried away with Cavalia, they are art and magic. And then take some home to your horse. If that isn’t possible, find motivation on YouTube, or in your own pasture. If you lack youthful exuberance, make up for it with wisdom and patience. Not to mention a good helmet to protect your valuables. Sure, it means that there are some cues that we take from them. Learn to speak with your body and watch for an answer from him. Expect that it might go slow at first but at the same time, know that both you and your horse are part of a rich and valuable tradition, handed down through history. Even in your own round pen, you share in the beauty and freedom that are part of the ageless conversation between a horse and a human. With no apology or intended disrespect, know that you and your horse are Cavalia, too. I, too, saw a Cavalia show and was surprised at how wonderful it is. I lucked out into finding the book by the original Cavalia trainers at a used book store – “Gallop to Freedom.” They call what they do “play” rather than training. They talk about being flexible about the horses’ moods. For them, it’s all about the relationship. They don’t expect exact perfection in each performance. And they never talk about dominance. I do what is often called “clicker training.” I’ve been dissatisfied with how horses respond to how it is typically done. I’ve incorporated some Cavalia techniques and everyone is happier. I would like to see it. thanks for the recommendation and as always sound perspective. Here! Here, Anna!! But don’t you think the horses in Cavalia are less forced? I’ve actually not been, so I’m curious as to your thoughts, if you get a bit of time. I’ll be at the Horse Park on Saturday morning at least, and probably some of the afternoon. I’ll be hanging out a little with Iron Horse Stables, since Grant Schneidman will be riding Maude RF, the last of my sport horse breeding program showing here in the U.S. And I’ll be the older short person hanging around Ring 1 with a ball cap or cowboy hat and a big white lens on a big heavy camera. I told the owner I’d photograph Maude, but I sure don’t like photographing dressage as a whole. It’s the horses’ eyes, as you well know! Heck of an impediment to an equine photographer! I spoke to Daisy yesterday at a clinic, and she said she didn’t like my idea of zooming to the front range and back again, so she’ll figure something else out. It looks like I won’t make it over to your place til spring, actually. Daisy said on the phone you sound just like you write! Awesome, I thought! I got to see Cavalia a few years ago and also enjoyed it immensely. As for “ground play,” I have a challenge. 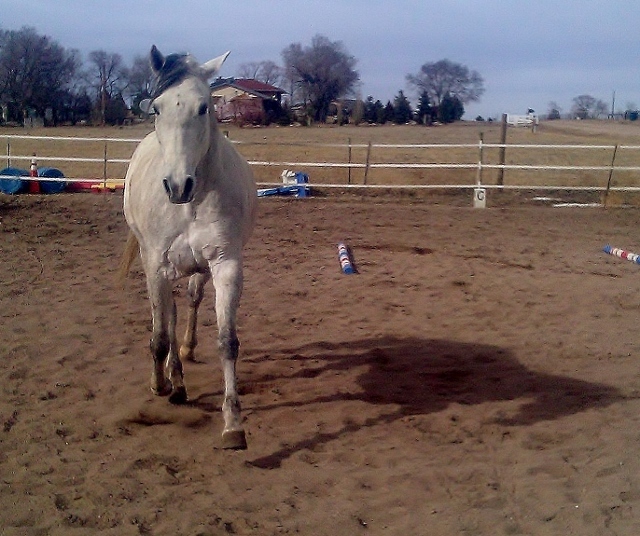 My 6-year-old domestically bred mustang was his timid breeder’s first foal. So in spite of my “lead mare” leadership for the two years I’ve had him, he easily slips back to thinking humans are lesser herd mates that can be played roughly with, intimidated or ignored. He does pretty well with my consistent expectations in close quarters and under saddle, but I don’t know that I would trust him at liberty. Would love to be close enough to you to come for some lessons! I would love to be that close too. This is my favorite training question. (Start in a really small area for liberty work, even his pasture or run, with leading and stopping cuing with your feet only.) Where are you at?? I’m in NW Oregon. We regularlywork in hand on a loose lead, basically “heel” work, with him walking, stopping, backing up and trotting with me. But he’s always mouthy, wanting to grab tack, grab me; generally just mess with stuff (we’ve finally come up with a way to secure his stall door that he can’t open). And yet, he’s very much an energy-conserver under saddle…. I bought the music cd after I saw the show so I could recreate my own cavalia at home. Great idea… I didn’t think of that! I got to watch a video of the show they put on previously in Denver, and it was amazing. Zack and I used to play tag when we would take our walks together in our neighborhood. I used a lead rope going away but he always followed with me at liberty on the way home. I would run off to try to hide behind trees and he would run after me so I couldn’t get out of site. He was so cute! Zack has it in his blood!